MARTIN, Tenn., Jan. 20, 2018 – AGRICULTURE COMMISSIONER SPEAKS TO WESTSTAR CLASS – Tennessee Commissioner of Agriculture Jai Templeton spoke Jan. 4 during the opening session for the 2018 WestStar Leadership Program class. He spoke during a lunch held in the Hardy M. Graham Stadium Champions Club Room as part of the “Agriculture and Transportation” session held in Weakley and Obion counties. The commissioner, a 1999 WestStar graduate from McNairy County, discussed the West Tennessee’s agricultural industry. Templeton was appointed by Gov. Bill Haslam and sworn in as the state’s 37th agriculture commissioner in May 2016. 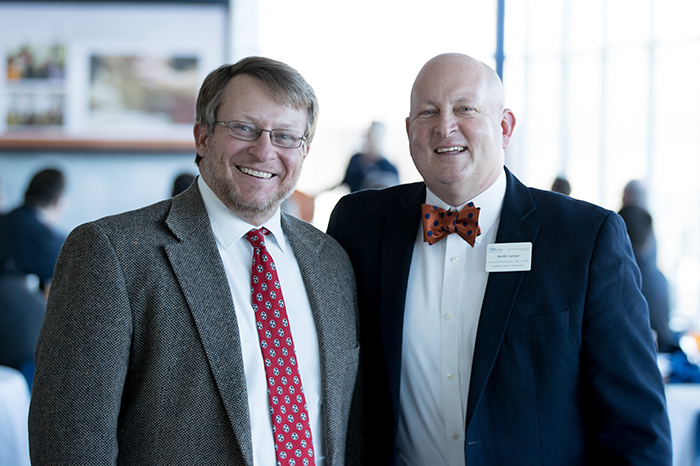 The next WestStar session is Jan. 25-26 in Brownsville and Covington and will cover “Fundamentals of Economic Development: Building Communities from the Base Up.” Templeton is pictured with Chancellor Keith Carver, a 2009 WestStar graduate.